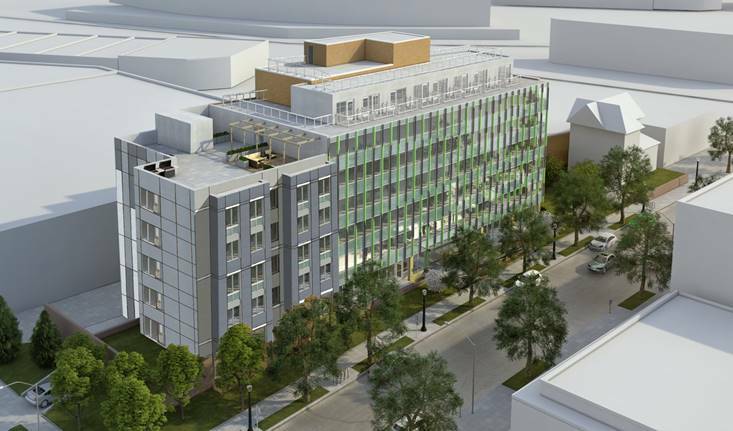 “Urban Investment Partners (UIP) of Washington DC has unveiled Frequency Apartments, a 100-unit luxury apartment community located in a former northwest Washington, DC office building that housed National Public Radio affiliate WAMU. UIP acquired the building at 4000 Brandywine Street, NW, along with two other properties, from American University in 2016. The company has now completed a $14 million year-long 36,000 square foot gut renovation and a 14,000 SF addition to the building, which is just one block from the Tenleytown-American University station on Metrorail’s Red Line. UIP joined with Tenleytown Main Street to officially open the neighborhood’s newest multifamily residence. “Frequency is our most contemporary apartment community to date,” said UIP Principal Steve Schwat. “The name is derived from its history as a radio station and recording studio for WAMU/NPR programming, including the syndicated talk shows hosted by Diane Rehm and Kojo Nnamdi. The distinctive open-space apartments at Frequency offer luxury plank flooring, custom cabinetry, stainless steel appliances, designer lighting, quartz kitchen counters, spacious modular closets, large bathrooms, and individually controlled hearing and cooling, and ensuite laundry equipment. Residents of this new pet-friendly community will enjoy keyless entry, a roof deck with grilling area and panoramic views, a state-of-the-art fitness center, resident lounge, teleworking space, conference and meeting rooms, bike storage, resident lounge, package acceptance, and reserved garage parking. For leasing information, visit https://thefrequencydc.com/, or call 202.759.9159. Frequency is convenient not only to Metrorail but also to 11 Metrobus lines, the American University shuttle (on the same block), and the Sibley Hospital shuttle. The many dining options within walking distance include the popular District Taco, and Jose Andres’ recently open fast casual vegetarian destination Beefsteak. Other nearby destinations include the new American University Law School, the highly regarded Wilson High School, Wilson Aquatic Center, Fort Reno Park and concert stage, and the Friendship/Tenley Public Library. Named in the late 1700’s for local tavern owner John Tennally, Tenleytown surrounds the site of Civil War-era Fort Reno, built on the city’s highest natural ground at 409 feet above sea level. By 1900, the last remains of the fort had been replaced by a reservoir, water tower, and a park that features sports fields, playgrounds, tennis, and more.